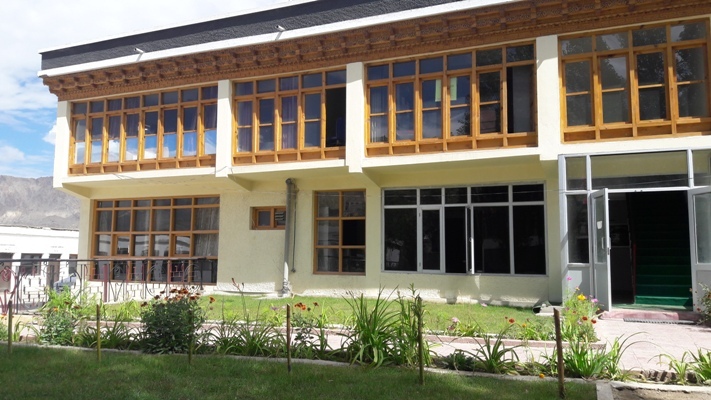 The District Court Complex was established at Leh(Ladakh) on December, 1978. District Court Complex Leh is located in the main town of Leh. There are Three courts i.e Principal District Sessions Court , Chief Judicial Magistrate Court & Special Mobile Magistrate. One Munsiff Court is located at Nubra Which is about having distance of 200 Kilometer from District court complex Leh & Second Munsiff Court is located at Khaltsi which is about having distance of 95 Kilometers from District Court Complex Leh. Leh (Ladakh) was known in the past by different names. It was called Maryul or low land by some Kha- chumpa by others. Fa-Hein referred to it as Kia-Chha and Hiuen Tsang as Ma-Lo-Pho.It is said that the first Immigrants to this land appears to have been the Brokpas from Dadarstan who inhabited the lower reaches of the Indus Valley popularly known as Sham. Another wave of Immigrants who came from karja (Kulu) were the Mons an Aryan type who first settled in Gya and spread to Rong, Shayok, Sakti Tangtse and Durbuk, the area extending from Martselang to Khaltsi. Gia was the seat of government of the first Mon ruler having been elected by the whole tribe. His kingdom included the villages mentioned above, all of which wasinhabited by the Mons people He was known by the title Gyapacho, derived from his being the master of Gia.The ancient inhabitants of Ladakh were Dards, an Indo- Aryan race. Immigrants of Tibet, Skardo and nearby parts like Purang, Guge settled in Ladakh, whose racial characters and cultures were in consonance with early settlers. Buddhism traveled from central India to Tibet via Ladakh leaving its imprint in Ladakh. Islamic missionaries also made a peaceful penetration of Islam inthe early 16th century. German Moravian Missionaries having cognizance of East India Company also made inroads towards conversion but with little success.In the 10th century AD, Skit Lde Nemagon, the ruler of Tibet,invaded Ladakh where there was no central authority. The lands divided in small principalities were at war with each other. Nemagon defeated them one by one and established a strong kingdom at Shey, 15 kms from Leh, as its capital. Ladakh was an independent country since the middle of the 10th century. King Singge Namgyal had consolidated the Ladakhi Empire into a strong kingdom. He was not only a strong monarch but a statesman, a diplomat and a builder. He built the historic 9- storeyed Leh palace and made the other neighboring countries envy of such an elegant palace. He also promoted horse polo in Ladakh.In the ancient times the present Leh district was a part of Greater Ladakh spread over from Kailash Mansarover to Swaat (Dardistan). The Greater ladakh was neither under the Domain of Tibet or its influence. Not much information is available about the ancient History of Ladakh. However, reference about the place and its neighbourhood in Arab, Chinese and Mongolian histories gives an idea that in the 7th Century A.D fierce wars were fought by Tibet and China in Baltistan area of the Greater Ladakh in which deserts and barren mountains of Ladakh was turned into battle fields for the warring armies.In the 8th century A.D Arabs also jumped into these wars and changed their sides between China and Tibet. Around this period, the ruler of Kashmir, Laltadita conquered Ladakh. In the 8th Century A.D itself, The Arabs conquered Kashghar and established their control over Central asia which embraced Islam in the 9th century A.D and thus a buffer state came into being between Tibet and China, terminating the hostilities between the two warring countries. The greater Ladakh also fell into peices. A thousand years ago before the contol of Tibets rule, king Skitde Nemagon, ruled over Ladakh which was known as Muryul (Red Country), as most of the mountains and the soil in Ladakh wears a red tinge. In the 10th Century A.D Skitday Nemagon, along with a couple of hundred men, invaded Ladakh where there was no central authority. The Land was divided in small principalities, which were at war with each other. Nemagon defeated all of them and established a strong central authority. Those days Shey, was the capital of Ladakh became to be known as Nariskorsoom, a country of three provinces. The present Ladakh was divided into two provinces while the third comprised western Tibet. The area of western Tibet slipped away from the kingdom but was reunited in 16th Century A.D. by the famous Ladakhi ruler Sengge Namgyal. Ladakh was an independent country since the middle of 10th century.In the post-partition scenario, Pakistan and China illegally occupied 78,114 sq. km and 37,555 sq.km of the state, respectively while the remaining part of the state acceded to India. Pakistan also illegally gifted 5180 sq.kms of this area to China. Ladakh, comprising the areas of present Leh and Kargil districts, became one of the seven districts of the State. In 1979 when the reorganization of the districts was carried out, theLadakh district was divided into two full fledged district of Lehand Kargil.